Bass Stopper Worms = KISS! Bass Stopper worms have been around for decades. One of the biggest reasons they've been around for decades, besides catching tons of bass is KISS. KISS = Keep It Simple Stupid. These pre-rigged worms are about as simple as it gets when it comes to bass fishing. As simple as they are to use, there are still a few tricks that will help you become a more successful angler. First, always use a swivel when casting a pre-rigged worm. This will help cut down on line twist and make your day on the lake more enjoyable. 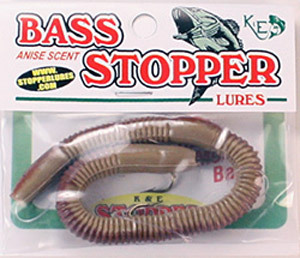 Second, the Bass Stopper worm comes in several colors. Some of the colors include Purple, Black, Natural and others such as Crawfish. All of these colors have been around for years, pick out your favorite color and give it a try. 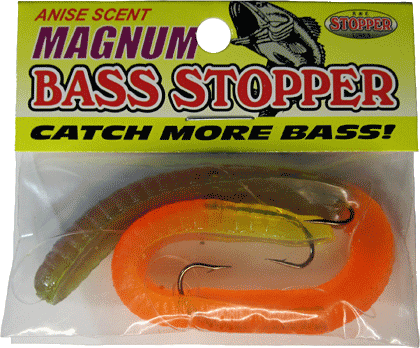 Next, the Stopper worms come in two styles, Bass Stopper and Bass Stopper Magnum. The Magnum is a larger version of its little brother and works just as well. The Magnum is also offered in the same colors as the Stopper worm. The last item, all Stopper worms come three hook regular, two hook weedless or three hook weedless. If you're fishing in heavy weeds or pads, a weedless worm may be your better choice. Bass Fishing Tips and Articles on how to find and catch more bass, bass fishing techniques, fishing lures and gear including boats, motors and electronics and where to fish - finding the best bass waters.